This week we didn't really go anywhere of interest. It was a really restful week but also one of some reflection. I have been in what I call a "cranky funk" lately. I have had so much on my mind and trying to keep the house clean, the girls doing what they are supposed to be doing, plus re-learning how to do everything, I have not given myself much time for reflection. I decided this week that I have been keeping busy with the things that need the most urgent attention but aren't necessarily the most important. 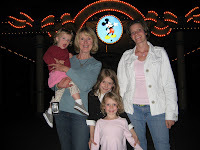 Plus, Bailey made a comment at Euro-Disney that Mom is always cranky. While I think that is a huge generalization on her part, it did get me thinking about it. I was also inspired by several blogs that I finally had a chance to sit down and read this week. Let me say first, that I have not been giving my husband his due. By that I mean I have not been appreciating him the way I should. He is a wonderful man who is spiritual, but still fun. And, his hard work affords me the ability to stay home with my girls, raise them the way I think they ought to be raised, and have so much fun experiencing all of their super funny moments (and not so funny moments). That is something Greg only hears about from me. I certainly have not been giving him the credit he deserves. The worst part about this crankiness is that it has unfortunately been rubbing off on other family members. So, this week I decided "No More Crankiness!" Call it a new rule in the family. We have used that phrase several times this week and it seems to be working. I just forgot that all the things I was worrying about were not so important, and the really important things got put on the back burner. Also, I realized that I was trying too hard to do everything myself, instead of asking for help. The blessing in all of this is that I realized it when I did, with a little help from Bailey. I'm glad we didn't let several years slip by being consumed by the cranky funk. Several people have said that they like hearing about all the places we are going and seeing. But, I felt like it was getting a bit too travel logish (if that is a word) so I'm going to try a bit more balance between what we are doing and what we are feeling as well. Sorry if this post disappointed anyone, but I felt like I had to write it. Thanks to all of those other bloggers out there who are using this medium as a way to inspire people to be better. And, to those who have said they are living vicariously through us...I just have one thing to say, COME VISIT!!! We would love to have you. Plus, I'm not cranky anymore. Bonus! The beginning of the week was spent getting ready for Linda (Greg's mom) to come. We tried to tidy up a bit and make sure everything was fairly organized. Linda arrived on Friday morning. Greg picked her up from the airport and they met Avery and I at home. Bryn was taking her nap so it was nice for Avery to be the first one to see Nana. She was very excited, she spotted them outside the window and went running outside. It was nice to be able to show her around our place so that she could understand what we have been talking about all of this time. Greg and Linda went to pick Bailey up from school. Bailey was very excited as well. We walked downtown Bad Godesberg and had some spaghetti ice. Then we took the train to Bonn, and walked around the fussganger zone a little bit. We returned home on the train to the tune of Bailey singing in German and Linda singing in English, "Love is Spoken Here." We returned home and Greg cooked up a great dinner with steaks on the grill, sweet potato fries, and one of his signature salads. We ate on the balcony by candlelight after the girls went to bed. It was very peaceful. Saturday, we decided to drive to Maastricht, Netherlands. We heard it was a cool town. When we got there we walked around town for a while. It looks like a great place to shop, although we didn't do too much shopping while we were there this time. We saw some ruins left over from the 1300's. We stopped and got the girls McDonalds for lunch, they can spot them a mile a way. For us, we tried a sandwich place that was really good. We left and continued on our journey for the day to Monchau. Linda loved it. It is a quaint little German town. We bought some printen which is like a gingerbread/licorice cookie that has different frostings. Sunday, we went to Church, where Bailey and Avery had their first primary program in German. Avery held the picture of Christ with the children while each child in her class said something. Bailey sang every song in German and when she had to say her part, she said it in English. We were extremely proud of both of them for participating as much as they did. Linda was thrilled that she could be there to see them. We cooked up a regular German dinner for Linda, complete with Hanchen Schnitzel and spatzle. Monday, Greg took the day off. 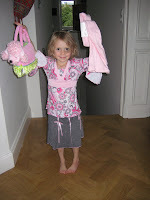 We started the day by going to Siegburg, which has one of our favorite childrens' stores in the area. We did a little monetary damage there, but we found a few presents for Bryn's upcoming birthday. We walked around the city a bit and by that time, we had to go back to school to pick Avery up. We picked her up and went directly to Koln. We got Linda her first Doner Kebab while we walked through the shopping area to the Dom. Unfortunately it took us too long to walk all the way there and we were afraid that if we climbed to the top, we would be late picking Bailey up from school. So, we skipped climbing to the top. I felt bad because this is the second time Linda has been there and not climbed to the top. Next time, it will be a must! Linda spent some time with the girls playing when Bailey got home from school. We arranged to have a babysitter so that Linda, Greg, and I could have a nice dinner out with some adult conversation. We were tentatively planning on going to a Biergarten for dinner, but because of the German food the night before and the fact that we were in the mood for something familiar, we ended up at Vapiano. It is a nice Italian place which Greg and I have been to a couple of times. On Tuesday, it seemed everyone was very tired. Avery stayed home from school because she had some leg problems in the middle of the night and didn't get much sleep. Linda didn't get much sleep either as Avery was sleeping with her. So, we just stayed home in the morning. In the afternoon, Avery was feeling a bit better with a little help from children's motrin but Bryn went down for a nap and slept a really long time, so we were stuck at the house most of the day. Greg was disappointed in our lack of sightseeing activities. But, I think we made up for it the rest of the trip. Wednesday, Linda and I had the girls and ourselves ready to school when we dropped them off for school. We went directly to a little pottery town called Adendorf. We found a really cool topferei and the gentleman that worked there was very nice. He was speaking to us in German, but he spoke very slowly and enunciated so I could understand what he was saying. He took us on a tour and showed us the back room where the pots were drying and even the Kiln that was in the process of firing. We went into several other shops but we both agreed that we liked his work the best. Linda bought an ornament in his shop and I plan to go back when I have some money on me. we stopped at the backerei in town and purchased some croissants, brot, and a mandel hornchen. Very sweet but very good. We picked Avery up from school and went to a refurbished old train station that is now a museum and a bistro at Rolandseck. It had a beautiful view of the Rhein River, but lacked the kind of food the kids were looking for. I think they would have been happier with McDonalds. It would have been very pleasant if the girls would not have been with us. But, we made the most of it and Linda got some great pictures from the experience. I got a haircut, my first one in Germany, and it turned out pretty good. It was just good to get it cut. Then, we raced over to school to meet Bailey and fill out Girl Scout forms. While Bay had girl scouts, the rest of us played at the playground. After Bailey was finished, we went downtown Bonn to see if the Beethoven House was still open. We made it with a half hour to spare. It was a quick tour because we had to be out quickly and the girls had had quite a long day. We went the the children's store downtown Bonn to get a birthday present for a little girl in Bailey's class and by the time we finished, the girls were very tired and very hungry. Greg was already home from work and made really yummy crepes for dinner. We had some of the crepes with egg, ham, and cheese, that we loved from Pittsburgh, and some dessert crepes - my new favorite is nutella, strawberries, and bananas, with a little whipped cream of course. Thursday we drove to France. We got there around 2:00 pm in the afternoon. When the girls saw the sign as we were driving in, their expressions say it all. It was a really fun afternoon, full of fantasy. Bailey's favorite was the Peter Pan ride. Avery's favorite - the tea cups. Bryn's favorite was the flying Dumbo ride. Greg's was "It's a small world." I think Linda and I didn't really have a favorite, we just enjoyed watching the girls having a great time. We stayed pretty much until the park closed and then checked into the hotel. The Davy Crockett Ranch. It worked out really well for us because one room could accommodate all of us. They had a large pool that we went to which was fine. The girls seemed to enjoy it. We got home pretty late and were all very tired. 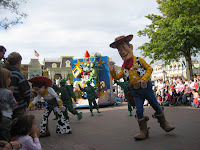 Friday morning, the park opened at 10:00 am. With our room came what I thought was an awesome continental breakfast. We had warm French croissants, jams and chocolate spread, a baguette, orange juice, hot chocolate, milk. It gave us enough of a start to hit the park pretty hard that morning. For lunch we had already made a reservation to eat at Cinderella's Castle, where we personally got to meet, take pictures with, and and get autographs from several Disney characters...Cinderella and Prince Charming, Snow White, Ariel, and two of the mice, Suzy and Perla. It was really fun for the girls. After lunch we decided to blaze into the city for an afternoon via RER. 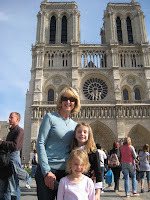 We took in a few Parisian sites - Notre dame, Musee D'Orsay, and La Tour Eiffel. We took the train back to Disneyland and the girls were remarkably chipper still dancing around on the moving walkways out to the parking lot. Saturday morning our goal was to be at the park by 8:00 am when it opened to Hotel guests. We were a bit optimistic but still made it in pretty early. It was far more crowded on Saturday than it had been the previous days. 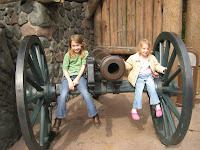 We did a few things in Fantasy land that the girls wanted to do again. We tried a couple of new things. Bailey's new favorite was Big Thunder Mountain. I think that was her first real roller coaster. 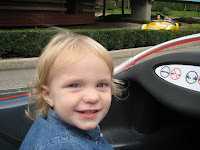 She loved it and went twice in a row thanks to our fastpass tickets. We ate lunch at the Frontierland Big American Barbeque, which was so good. We did a bit of Discoveryland in the afternoon, but so many of the rides had a hour or so wait that we had to pick and choose the most important to us. We finished the day eating Chocolate Brioche Mickey buns and popcorn and watching the Disneyland Parade which was a huge hit. We were in the front row and the girls could not get enough of the action. We made one last Minnie Mouse balloon purchase for Bryn and then it was time for us to be on our way. It felt like a long drive back but we made good time. Greg made Brats for dinner but I was so tired, I retired quite early. Sunday morning, Greg made waffles for breakfast. The girls wanted to all go to the airport to see Linda off, so we left around 9:30am. We dropped her off. It was a heartwarming good-bye. It was almost harder than the good-bye when we left because that one was so rushed and chaotic. We so enjoyed having Linda visit and we hope she enjoyed her stay. We drove home and took Bailey to her friends Birthday party which was all in German. The mom said that she felt sorry for Bailey because it was clear that she did not always understand what was going on. But, I keep trying to tell Bay that that is how she will learn German, by playing with the German girls and listening to them talk. It is tough because the language can't come quick enough. We all want to just be able to speak it. Now that we are settling back into our routine of returning to school, I decided to start some projects that have been hanging over my head. I wanted some curtains in the front room because that is where we will put our guests, if and when any of you come to visit us. I thought it is a little unnerving sleeping in a room that is street level with no curtains. It is just not as easy as running over to Joanns and picking out some cute fabric. I found out very quickly that it is cheaper to buy curtains than to buy fabric and make them. I spent quite a bit of time this week working on curtain projects. The girls are getting into their groove at school. Avery has continued to talk to her teachers and classmates this year which is a vast improvement over last year. We visited a couple dance schools and are still trying to decide which route to take concerning extra curricular activities. On Saturday, we went to Koblenz. We thought we would do a bit of sightseeing in the midst of the house projects. It was great. We didn't take the camera. Sorry. But, it was a really beautiful city and one I expect we will return to again and again while we are here. That is basically it for this week. I have no pictures for you. It was just business as usual. I almost forgot. We got to watch the Michigan game on the Internet. Originally Greg had called ESPN to find out why the international customers were not able to do a pay-per-view type thing for Big Ten Football. They said that they were not doing it this year. However, he checked their website before the game last week, and it was an option to watch the game. Despite the slaughter, it was rather nice to sit back and watch the game. It felt like Fall in Michigan again. Monday was the first day of school. We had some car issues on the way to school so it was a lucky thing that Greg decided to follow us to school that morning. We hopped in his car and took the girls to school and then drove back to where my car was parked and took care of the issues. It was relatively easy to solve. 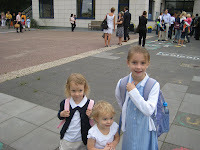 I was very nervous for Avery especially as she seemed quite uneasy about starting school. However, when we got there, she found out she would have one of the same teachers that she had when we got here in May and Ava Lesh is in her class. What a blessing. She even talked to her teachers which has been a major milestone for her. I was very pleased with the way the first day went for both of them. We checked out some dance studios and are trying to figure out the way extra cirricular things work around here. It was a very busy week trying to get back into the swing of a routine. Friday was Avery's 4th birthday. We took cupcakes to school for her class to share in her festivities. We had her birthday party on Friday evening. She only wanted to invite a few friends. 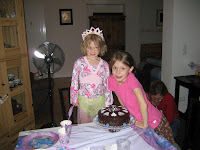 The cake was quite an ordeal as she wanted a barbie cake. I was all ready to try it but could not find a bowl that I could bake in. She compromised by saying a round cake with a Cinderella candle on top would be fine. But, I couldn't find a Cinderella candle. 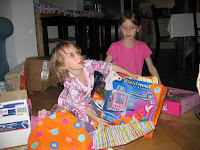 Luckily, my mom sent a Cinderella polly pocketesque set from the Disney store to her for her birthday. 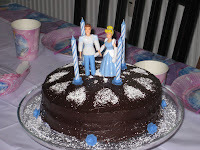 We were able to talk her into a regular round cake with Cinderella and the Prince on top. I must say it turned out pretty cute. She was happy with it and that was all that mattered. We sang "Happy Birthday" in English first and then sang "Happy Birthday" in German. I was a nice little get together. The kids just played and the Adults had some time to visit. We then let the kids frost a tiara cookie and take it home for their party favor. Saturday, we were very tired. We walked downtown Bad Godesberg to the morning market to get some fruit and veggies. Then we spent most of the day doing some errands. Greg was very disappointed that he could not get the U of M football game on the internet. Apparently, he didn't miss much as they lost. I should've known that if Greg wasn't able to watch them play, they would fall apart huge. It doesn't say much for the rest of the season as the new Big Ten network won't stream the games on the internet. That is about it for this week.